Saturday October 14th 1899 Julia and I worked till three oclock in the afternoon picking the ducks only stopping long enough to get a little dinner. Will went to Hawke's in the morning for the apples. Late in the afternoon he blacked and put up the sitting room stove. A pleasant day. 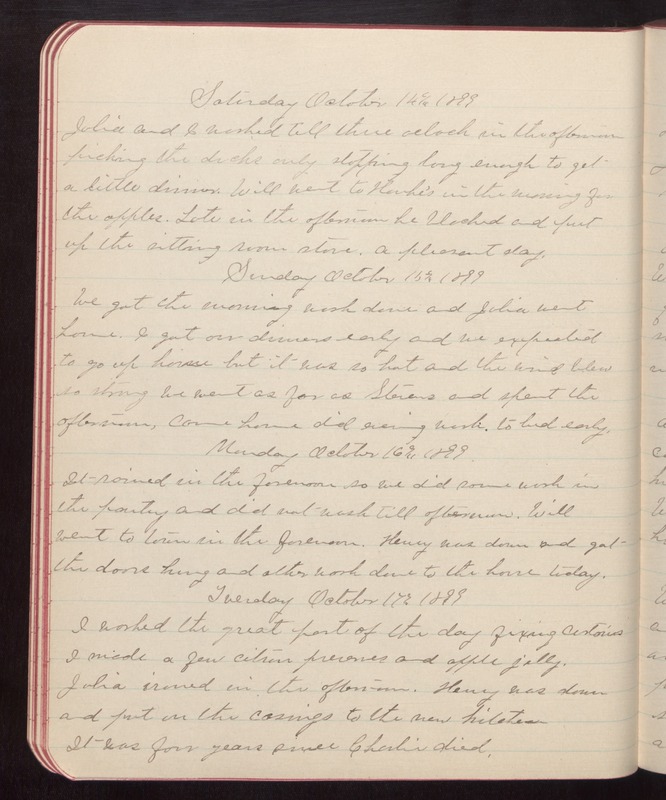 Sunday October 15th 1899 We got the morning work done and John went home. I got our dinner early and we expected to go up home but it was so hot and the wind blew so strong we went as far as Stevens and spent the afternoon, came home did evening work. to bed early. Monday October 16th 1899 It rained in the forenoon so we did some work in the pantry and did not wash till afternoon. Will went to town in the forenoon. Henry was down and got the doors hung and other work done to the house today. Tuesday October 17th 1899 I worked the great part of the day fixing curtains I made a few citron preserves and apple jelly. Julia ironed in the afternoon. Henry was down and put on the casings to the new kitchen It was four years since Charlie died.